St Cuthbert, bishop of Lindisfarne (Holy Island), links the early and late middle ages in Britain, with the start of his career in the foundations and early history of Northeastern monasteries in the mid-7th century, the journey of his relics through several Northern centres during the Viking onslaughts of the 9th and 10th centuries, and enshrinement at the end of the 10th century at Durham, whence kings and churchmen, North and South, continued support of his cult. Beginning soon after his death (687), a sophisticated campaign promoted Cuthbert's holiness with works of art and literature, such as the Lindisfarne Gospels and accounts of his life. Bede wrote prose and verse versions, copies of which are in this manuscript. Often it is attributed to Canterbury because of its decoration's style, but a monastery in Wessex, such as Sherborne, has been suggested based on the contents of a prayerbook placed after its 'Lives' of Cuthbert. 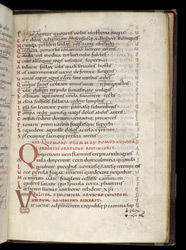 A page from Bede's verse 'Life of Cuthbert' shows the glosses or explanatory words written over the lines of the poem. Bede was unusually knowledgeable in his use of Latin grammar and vocabulary for an early 8th century author. When this manuscript was written about three centuries later, the scribe added more commonly used latin and--in some cases--Old English words to aid and instruct the reader. At the lower right, the scribe had to squeeze in the last word and drew a fancy marker--a 'runover mark'--directing the reader to it before turning the page.